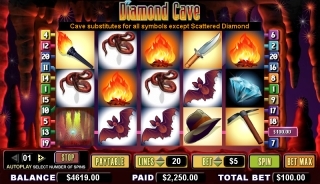 Diamond Cave is a CryptoLogic Slot Game Release. Exploring a cave is only fun if you're a kid or seeking treasure and the latter becomes your quest when playing this fun, 5 reel, CryptoLogic slot game. With 20 pay-lines and wagering from 1¢ per pay-line to a lucrative $5 per payline the wins on each spin are frequent. The prize amount increases with each different reel symbol and when combined with the substitute or wild Cave symbol can net some rewarding pays. A matching combination of 3 Knife or Axe symbols stopping on a covered pay-line pays 5 times your wager while 3 Hat or Torch symbols pays 10. Get 3 Bat or Snake symbols to up it to 20 times your wager or 3 Fire or Backpack symbols to max out the win at 25 times your wager. Only 2 matching Map or Explorer symbols are required to return 5 times your wager. Get all 5 Map symbols and your in the money by 500 times your wager and lining up 5 Explorer symbols across a covered pay-line will increase that by another 750 or 1250 times your wager. Of course the pays for a winning combination of 4 like symbols is not too shabby either. However, the big payday comes when matching 5 Cave symbols on a covered pay-line for win of 5000 times your wager. Top prizes or not, no video slot game is complete without some scatter symbols and no treasure is complete without some diamonds. Combine the two and you have the makings of a fun bonus round and some random scatter wins as well. Get the Cave symbol on reel 1 and a Diamond scatter symbol on reel 5 and before you know it your in a cave seeking treasure in the Mines bonus round. As you walk through the darkened cave you'll come across 3 clay pots. Smash one of the pots to spill the diamonds and claim your prize. Choose wisely and you could win up to 500 times your wager. Continue on your journey until you come across the next set of clay pots to smash. The journey is complete when 5 clay pots are claimed and you exit the cave. Check out the Winning at the Slots Recommended Online Casinos and don't forget to Download our free guide to playing online casinos in either Adobe PDF or MSWord formats.